Follow Beto O'Rourke's meteoric rise from a virtual unknown to a national political sensation in his against-all-odds attempt to unseat Ted Cruz and represent Texas in the US Senate. Embedded with the candidate, his close-knit family, and his colorful group of political newcomers for the last 12 months of the race, director David Modigliani (61 BULLETS, IFFBoston 2015; CRAWFORD, IFFBoston 2008) reveals the human experience of running an unconventional campaign that questions the basic tenets of current American politics. 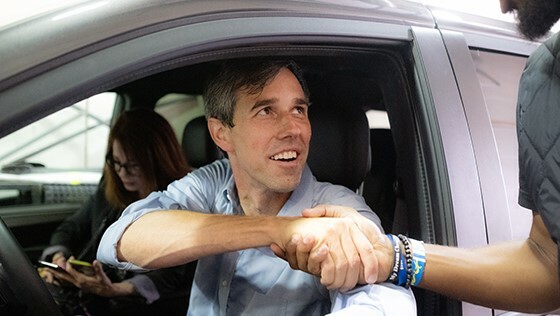 Along the way, Beto barnstorms across the 254 counties of Texas and inspires the best-funded grassroots campaign in Senate history. In addition to sharing the magic of a joyful, punk-rock warrior on the march, the film captures the struggles of the journey: holding a family of five together when only home a couple of days a month, competing in a state bigger than France without taking PAC or corporate contributions, and maintaining the stamina to court growing crowds and national media while forgoing sleep and weathering relentless negative advertising. Hilarious, heartbreaking, and hopeful, RUNNING WITH BETO will become an essential piece of the national political conversation in the run-up to 2020.